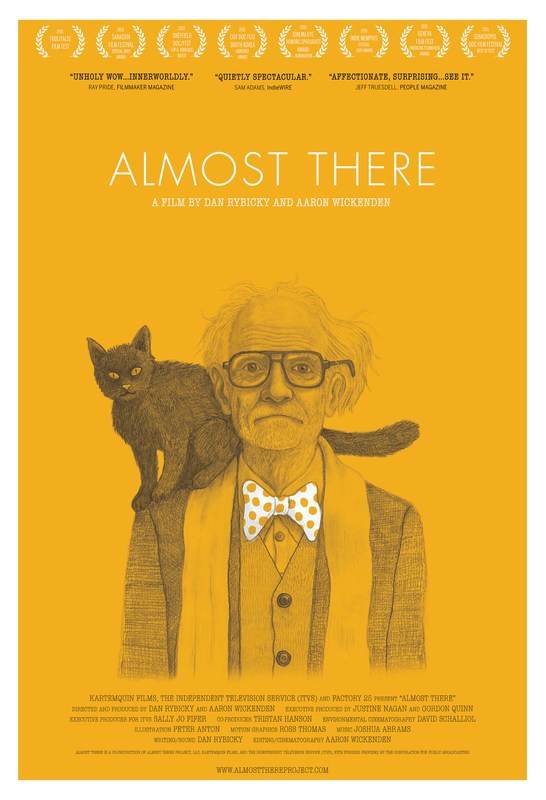 Almost There was nominated for the 2016 Cinema Eye Honors Spotlight Award, with its star, Peter Anton, named one of the year's "unforgettable" documentary subjects. The film world premiered at DOC NYC 2014, and was an audience favorite at True/False 2015 and in its international premiere at Sheffield Doc/Fest 2015. It has been honored with a Special Jury Award at the Sarasota Film Festival for "complex hands-on storytelling" and a Special Jury Award at Indie Memphis for "Visionary Storytelling." It also won the Emerging Documentary Filmmaker Award in Geneva, and the Audience Award at 2015 EBS International Documentary Festival (EIDF) in South Korea, before being broadcast on PBS in summer 2016. This special DVD comes with several bonus features and extra scenes, and is housed inside a beautiful interlocking cardboard package with no plastics or adhesives used. Distributed by Kartemquin and Factory 25.